Open Kitchen Shelves Revisited is a discussion of the whole idea of open shelves from of a different perspective now that I’ve had them for two years. If you’ve ever wondered if you would like the same in your kitchen, you mind find my perspective rather interesting. When we bought our house in 1991, the cabinets were the original varnished wood in a lovely orange-y flavor, circa 1979. I’m not sure how, but I convinced my husband we should paint them red. The merits and demerits of that decision are a subject for another time. In 2010, I was smitten by the wave of open shelves I saw everywhere on the internet. So one Friday night, as my husband sat at the breakfast table diligently preparing his BSF lesson, I quietly and unceremoniously removed the doors on a few of the upper cabinets. When he finally noticed, I had moved all plates, glasses, and other junk to the dining room. I then confidently announced we didn’t need those cabinet doors any more. He agreed only after I promised to keep the doors handy in case we needed to sell the house and put them back on. You can see the details of the whole project here as I described it a couple years ago. Today, I am revisiting the subject with a new perspective. I loved the way open shelves/cabinets forced me to keep the contents tidy. I also enjoyed how easy it was to empty the dishwasher because I didn’t have to constantly open and close cabinet doors. Guests could conveniently help themselves to a clean glass or a paper plate without foraging behind closed doors. Furthermore, I thought it made my kitchen look more interesting, like it was a happenin’ place. When we began to plan a remodel of the first floor of our house this past January, I proposed new cabinet doors with windows. Seeing his chance to get the doors back on, my husband went for it. It turned out to be a good compromise that suits both of us. Seeing the irregular pattern of white and clear-glass dishes breaks up all the red. I am still forced to keep the cabinets orderly, but the doors tie everything together. If you compare the before and after pictures, you will see we have also replaced the exterior windows, so the patterns echo each other. New windows call for new curtains, right? So I removed the black valances, which looked like heavy eyebrows over my windows– not a great look for 8-foot ceilings. In case you are wondering, I did NOT just have windows put into the original doors. That was my plan, but the cabinet man said it was not a good idea. So I still have the original doors (just in case you decide to buy our house some day and can’t stand for anybody to see inside your cabinets). P.S. I’m not addicted to Pinterest, but it did give me some great ideas for our little remodeling project. The pictures below are proof. 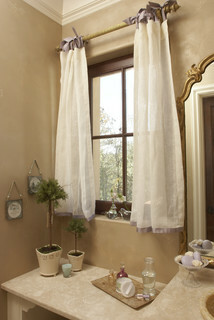 I pinned the image of the linen curtains from Houzz, another great site for decorating ideas. If you like home decorating projects, here is another Pinterest interpretation. 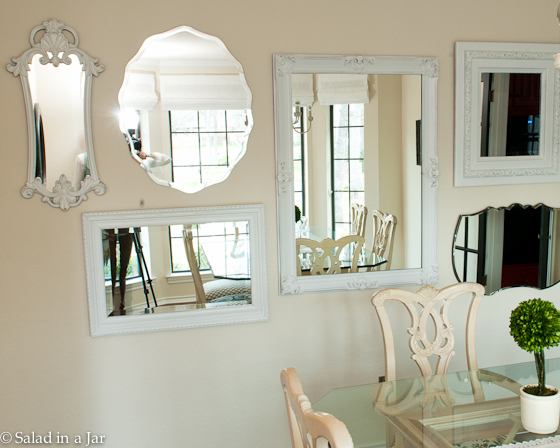 I’ve seen lots of black mirror collections on Pinterest but I love my white one–located in the dining room. Per my neice’s request: a picture of the unmatched but coordinated fabric on my dining room chairs. Sorry I don’t have a recipe today but these rooms all have to do with eating, so I hope you enjoyed seeing where the food on this blog comes from, especially since there hasn’t been much food coming out of my kitchen with all the construction going on lately. As soon as I find my bread machine and blender, I’ll be back in business. I really enjoyed reading how you went about this. 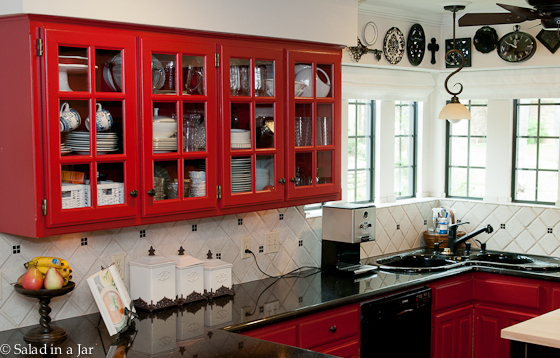 The red is great in the kitchen. 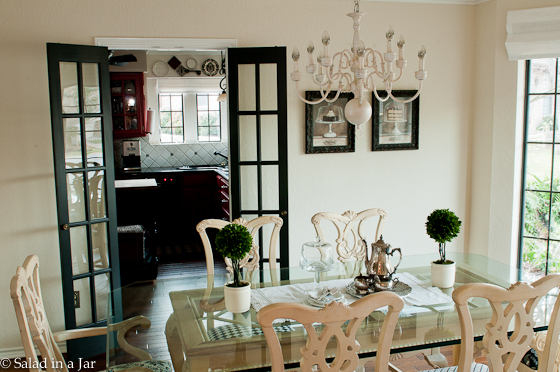 The new kitchen cabinets with glass are wonderful.And you white mirrors in the dining room are great. I have a odd-ball mirror collection in “My Room” (the place were I hide out much of the time).Your choice of color in every room are just beautiful. I really like the glass shelves I have 2 corner shelves in my kitchen that are glass and I love them. I’m not so orderly so without doors I would die or like you said be force to keep it tidy. Your home looks just wonderful, eye please and homey. When we moved in ’96 I thought I could live with (most of) the kitchen for a couple of years. One thing after another took presidence, so here it is 16 years later and we’re finally getting started. I never thought of just taking the cupboard doors off. I’m continually hitting my head on them because they don’t close easily. My hubby would love it! He’s not neat, but doesn’t like to bother with the doors. The cabinet guy we talked to gave us an estimate that was not much less than new cabinets. I want a face lift not a complete make over! I’d love a close up of your sink. I couldn’t copy it because I don’t have a corner. Does it really wrap around the corner? How cool! I love the look you’ve got. I would love to find some open spaces in my house. Thanks for sharing. PS: I’m with Gary – I still miss the pantry we moved from, but I’d love to just hose it all down and be done! I absolutely love opening shelving and glass-front cabinets. Someday my kitchen will have both….someday…. OK… the chairs are really cool!!! I love the complete dining room! p.s. My husband has started doing some paintwork in our house – I love it when that happens. I recently read your old post about the open shelves and loved the way they looked. But I must admit that your new cabinet doors with windows take the biscuit. They’re so stylish, but retain that nice open look of the open cabinets. Your home is beautiful! Piper, I think open shelving goes in the same category as painting wood paneling. The testosterone types have a hard time with it. I love the glass doors and the glimpse of your new wood floors! 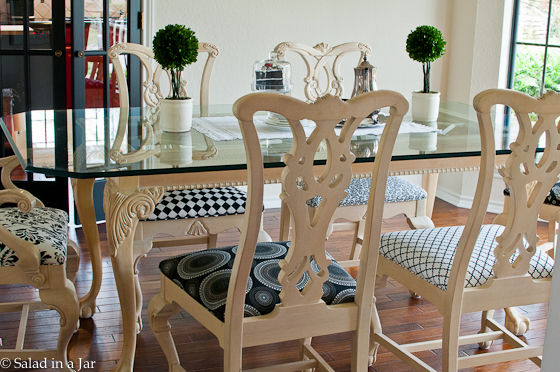 Can you share the name of the paint color in your dining room? I’m getting ready to repaint, and it looks so pretty and fresh. I do love the open shelves, but what you have done is a lovely compromise. I have both open shelves (former bookshelves for cookbooks until I got an office with a whole wall of shelves) and cupboards with windows in the doors in my kitchen and love them both. 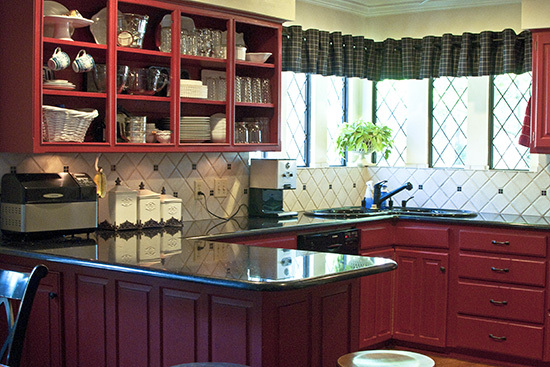 The kitchen looks beautiful… it must be a joy to spend time there whipping up your culinary treats. I have a hard time deciding what look I like better ~ all three cabinet styles look really nice to me. Thanks for sharing a glimpse into your lovely home! I love the glass cabinets and matching your windows to them was brilliant. I have a weakness for French doors (or glass paneled doors) and your diningroom makeover is beautiful. 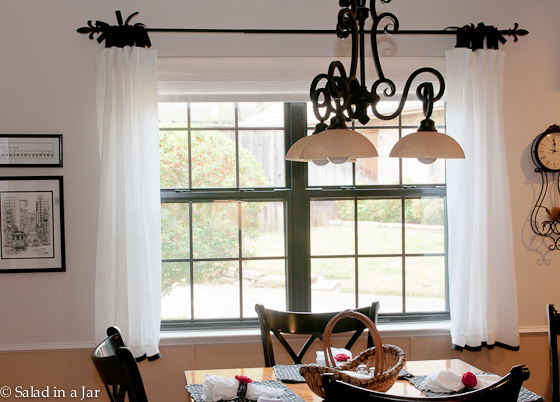 Your art display above your kitchen windows is stunning! Oh, that was fun! 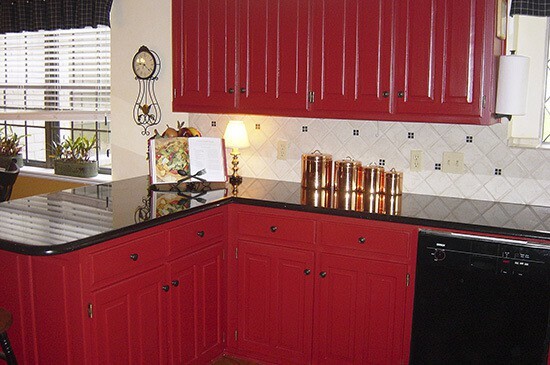 And I love the red cabinets. My ideal kitchen would have a huge walk-in pantry and minimal cabinets. Actually, it would be stainless steel and concrete with a hose at the end and a drain in the middle. Easy clean up–LOL…. Thanks for sharing your home. I am thrilled you gave us some before/after pictures! I think my favorite change is what you did above the sink windows. I also love the black doors to dining room. I want you to add a picture of the dining room chairs!